During my fifteen years of delivering mobility training to the visually impaired, a constant theme has been the frustration felt after sight loss of not being able to travel on holiday as before. The logistics of arranging transport, hotels, etc. have presented barriers. But the biggest obstacle encountered was if travelling alone “who would guide me?”. During mobility training much time is spent working in collaboration to get the determined traveller to their local shop, place of employment or worship, the pub. But these are familiar routes in local areas, often already well known to the individual. As a rule, though not an absolute, a professional would discourage someone with very restricted or no vision from going to an unfamiliar place unsupported. The dangers are obvious. Not knowing which direction to take, unfamiliar road layouts; and if abroad; different road crossings, traffic on ‘wrong’ side of the road, and communication issues when in difficulty. There has been a good history of visual impairment related travel in the UK. Some hotels specialise in holidays for those with sight loss in the UK. Guide Dog Holidays provided trips abroad; but this role was passed on to Revitalise who whilst offering hotels in the UK, have only limited overseas excursions. But help is at hand. Ten years ago Amar Latif, a visually impaired entrepreneur, identified through his own experiences a missing opportunity. A keen traveller who was willing to take the bold step to venture forth, he realised that there was a market that needed filling. Starting Traveleyes, a bespoke tour operator for the visually impaired, he knew that the key to the success of the company and therefore benefit to their target customer was the research, planning, and delivery of the entire package. 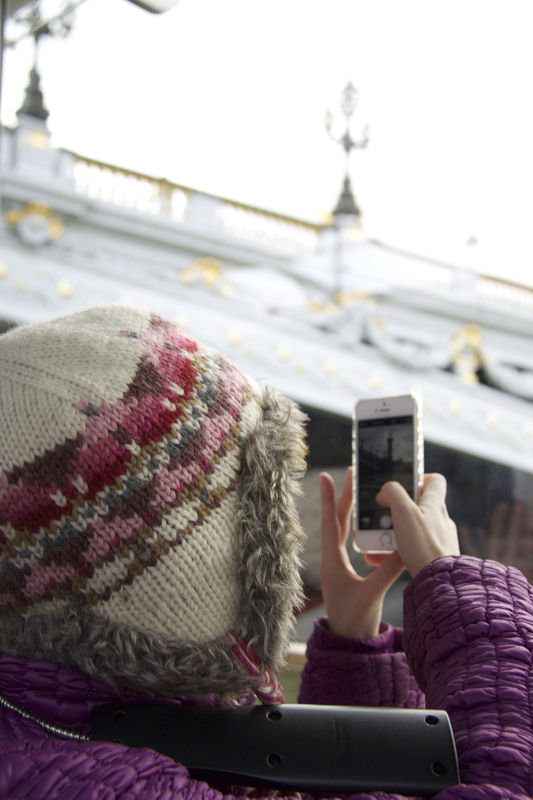 Transport, hotel, transfers, local knowledge…and sighted people to act as guides. 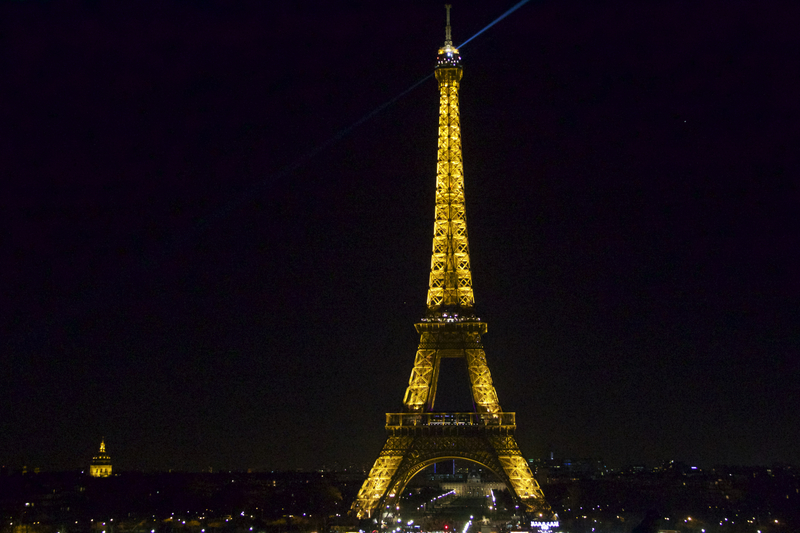 To find out more, I joined a five day trip to Paris. Traveleyes take bookings from the visually impaired customer and target the guides by offering them generously reduced prices. Booking numbers are kept to manageable levels, and Amar says that a group has never departed without insufficient guides; though he also acknowledges that finding new guides can be difficult. 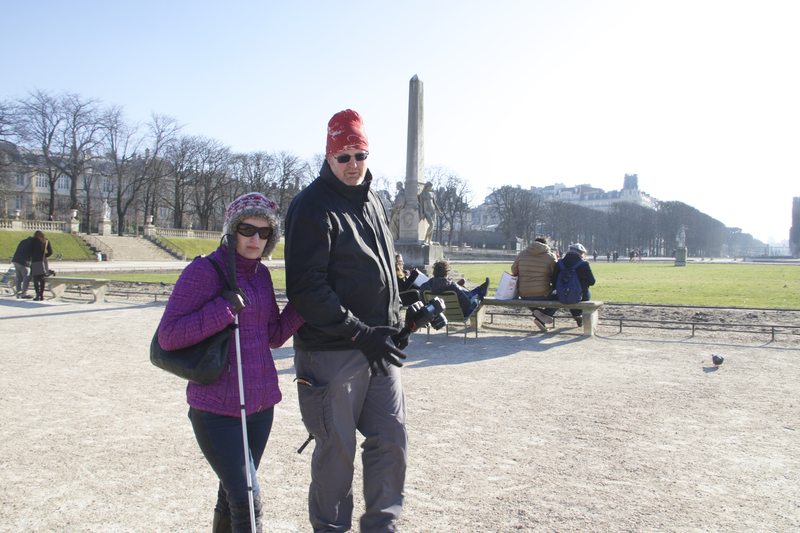 In our group there was Jenny, our Tour Manager; five visually impaired and seven (including myself) sighted guides. Repeat journeys for both the traveller and guide are common. Ages of visually impaired travellers and guides ranged from the young to the not so. We met at St. Pancras International Station where Jenny, talked through basic guiding techniques and encouraged the visually impaired and guide to communicate with each other so that both were happy with the experience. The advance planning also incorporated Eurostar whose staff supported our group through arrivals, security, immigration, and pre-boarding. The staff at Gard du Nord were equally expectant of our arrival into Paris, with support waiting. At our arrival in the hotel virtual room partners for the duration of the trip were paired up. The visually impaired had their own rooms, often shared with a peer unless a single room was requested; and sighted travellers familiarised them with their temporary lodgings. The virtual room partner also collected the visually impaired from their rooms for meals and departures. Other bespoke arrangements for guiding could also be arranged though not much time was spent in hotel rooms in any event. Neither the virtual partner or guide role included any personal care needs. Meals were taken as a whole group, or when exploring, smaller units. Each day a guide was paired up with a visually impaired traveller; we were fortunate to have two ‘spares’. The pairings were changed daily to facilitate a good mix of characters and conversation; and when interests clashed as they did, combinations would change during the day. For example, I guided someone around a historical building in the morning, but as the visually impaired traveller wished to go shopping whilst I visited a museum in the afternoon, the pairing was adjusted. It is important to stress that the sighted guides are also on holiday. During our stay, Jenny accompanied us every morning and into some afternoons. But great emphasis was put on ‘going off and enjoying yourselves’, and this is what we did. Tastes and experiences differed so the group of twelve often fractured, but there was always a visually impaired traveller and sighted guide together. The Metro was our preferred mode of transport, and Paris’ version was easy to navigate with stations close to one another. France, it must be said, is not the most accessible country in the world or even Europe. The Metro stations seldom has escalators and lifts were conspicuous by their absence. Toilets everywhere always seemed to be downstairs. But there was nowhere inaccessible to our troupe of explorers. 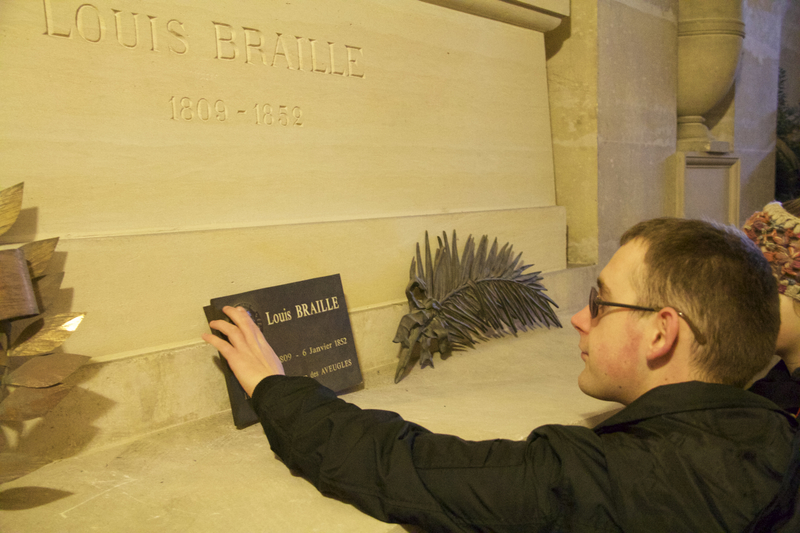 One such visit was to the Pantheon, the last resting place of one Louis Braille. Without forewarning of our arrival, Francois, a jovial employee arranged tactile books demonstrating the architecture of the building, offered an illuminating discourse into the history of the site, allowed us to access the lower burial chamber via a much more accessible flight of stairs reserved for the President of the Republic, and also opened up the crypt of the aforementioned Louis Braille allowing the group to enter and touch his sarcophagus. All of this was achieved without fuss or pageantry. Another ‘off-piste’ visit was to the Rodin Museum. Though not on the itinerary, three visually impaired travellers, four guides, and a Tour Manager arrived unannounced. The whole group was given free access (normally the ‘handicapped’ person and guide only receive such treatment). After speaking with the curators, Jenny obtained museum gloves for the visually impaired travellers to touch items where fingers are not normally allowed to wander. Group trips to the Eiffel Tower’s upper level though I’m not certain who was holding on to who; a cruise along the River Seine that was accompanied by an excellent audio commentary; a guided tour of the Latin Quarter by our excellent local guide, Malcolm. Excursions off the itinerary included the hop-on-hop-off bus; walks along the right bank; visiting Napoleon’s tomb and the Musee D’Orsy; and yes, shopping at Gallerie Lafayette. James, VI traveller with congenital glaucoma: “For me it was a chance to get out and do something that I wouldn’t have chance to do ordinarily; in a way that I wouldn’t be able to so I don’t have to rely on one person. I’m not putting out my family. I’m a paying customer. I can come and enjoy a holiday like anyone else”. 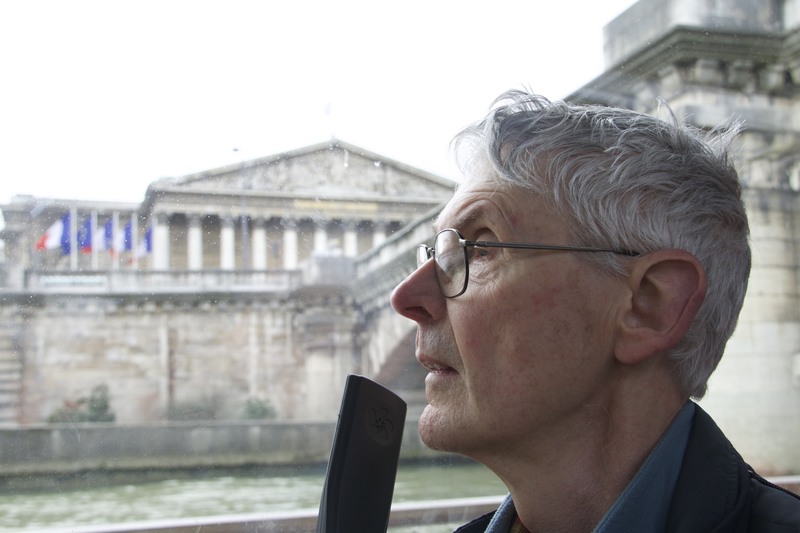 Alex, VI traveller with rod cone dystrophy and other health concerns: “No sighted person has dumped me somewhere and left. I was concerned that during free time I would be taken to my hotel room and left there for hours on end, but that never happened”. Chris, VI traveller with hereditary cataracts, aniridia, and retinal detachments: “I’d heard complimentary things about Traveleyes. There were so many highlights on the trip, but just being able to walk around and given the opportunity to explore. We had a lot of opportunity to do things that we might not have been able to do in a more organised context. You have to compromise with your guide but it was the level of flexibility that I liked”. Jillian, guide and documentary maker: “I came on the trip for a slightly different reason; to make a documentary on VI and imagination linked to one of the VI travellers on the trip. I learned that each visual experience is unique to that person”. Jenny, Tour Leader: “When you lead a group with Traveleyes, the guides notice a lot more things, the VIs get to experience things they wouldn’t normally experience, and I get a buzz about people going to new places”. But what do Traveleyes have planned for the future? The current programme includes destinations as diverse as the Lake District and China, Budapest and New Zealand. Despite almost the enter world being open to visually impaired travellers, Amar is determined to go further. Discussions are taking place wit the view of adding Oman to the list. Activity holidays are also popular. An upcoming sailing trip off the Croatian coast will compliment skiing in France, and walking and horse-riding holidays. Currently, on average one trip leaves every fortnight, though it is hoped to expand the programme to have holidays running in tandem, and increase the size of the groups. Very interesting Richard – maybe Andy and I could be volunteers???? You can certainly volunteer Chris…at a cost. 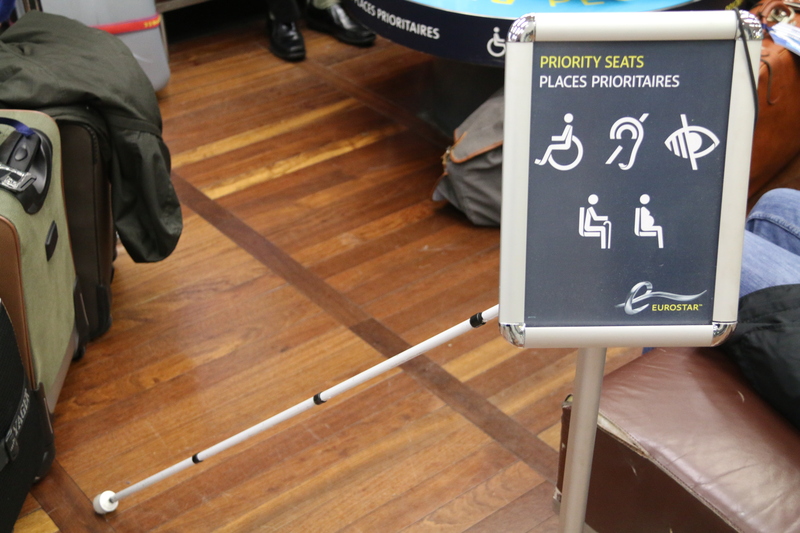 Sighted guides pay considerably less, up to half, the price of the VI traveller.